It's been a while since I've published a blog post but I'll hopefully be doing more blogging whenever time is an abundant source to me; I've seen a recent advert on Facebook about Sandboarding in Uruguay and I didn't think that Uruguay would be the kind of country to have sand dunes as I've known it to be full of farms, crops, harvesting, and urban central areas a bit like France, Switzerland, or even Ireland for that matter but I was wrong. I saw the advert for Sandboarding in Uruguay so I thought I would make a post highlighting facts About Uruguay! Uruguay was granted Independence from Brazil. Only Uruguay and Paraguay are the only 2 countries that were previously governed by Brazil, Uruguay was originally colonised by the Portuguese & the Spanish until Uruguay earned its independence following a four-way dispute between Brazil, Argentina, Spain, and Portugal. 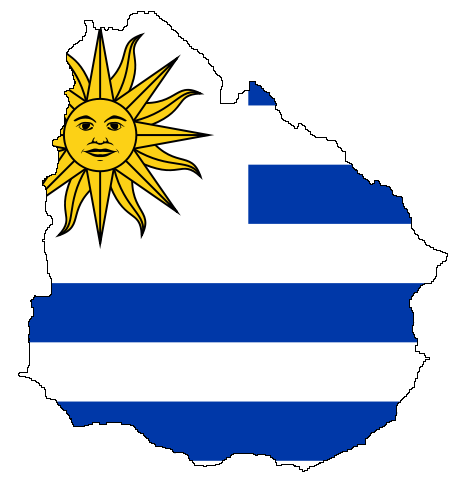 Prior to independence, Uruguay was a province of the Empire of Brazil known as "Cisplatina" up until 1828 when the treaty of Montevideo was signed (not the Montevideo Convention, but the Treaty of Montevideo) which was mediated by the British and lead to Argentina and Brazil recognising the newly formed country of Uruguay. The first FIFA World Cup was held here. In 1930, Uruguay held the very first FIFA World Cup competition, the home nation didn't lose a single game and in a 4-2 victory over Argentina in the Final, Uruguay won the first World Cup in 1930; to top this off, Uruguay also won the tournament in 1950 also, without losing a game. Uruguay is also proud rugby nation with 3 qualifications to the Rugby World Cup in 1999, 2003, and 2015. Uruguay also like Basketball and as of October 2015, they're 27th place in the world rankings. The world's humblest president: Jose Mujica. This 'humblest president' title wasn't for nothing, the president himself was in casual clothes for official meetings, he had donated 90% of his annual salary to charities (the Uruguayan presidential salary is roughly $12,000 USD); he lives on a farm, he drives a 1987 Volkswagen Beetle (fantastic car in my opinion! ), picks up hitch-hikers, and waits in line at a public hospital like everyone else. Here's some sad news on this gentleman, he was shot 6 times and put in prison for 14 years for opposing the country's former dictatorship. Despite being shot and imprisoned before becoming president in 2010, he's legalised gay marriage and marijuana, he's been responsible for the nation's rising salaries, and lowest ever unemployment rate; he ever left office in 2015 with a 70% approval rating! Treinta y Tres. The translation of "Treinta y Tres" from Spanish is "Thirty Three" or simply, 33. Treinta y Tres is the capital city of the Treinta y Tres department in the East of Uruguay, since the city & department is translated to the number 33; these next facts will sound spooky: the city and department are 33 degrees South, the postal code of the city of Treinta y Tres is 33000, the record low temperature in the summer is 33 degrees Fahrenheit, the city of Treinta y Tres and 2 surrounding suburbs make a population of 33,000, and finally the department is named because of 33 patriots in the 19th century that were honoured by the Uruguayan people. Demographics of Uruguay. The population of this country is 3.407 million as of 2013, with the capital city of Montevideo having 1.305 million people (this means that 38% of Uruguayans live in Montevideo.) Uruguay has a life expectancy of 76.91 years which is the 3rd highest in South America behind Colombia and Chile at 2nd and 1st respectively; Uruguay (according to Freedom House) has the most freedom in South America, it even beat France by a few points (I included France because of French Guiana in South America). Safety is amongst the highest in the region within Uruguay, crime is kept to a minimum; Spanish is the official language, the driving age is 18 and Uruguayans drive on the right hand side of the road, UK and US citizens do not require a visa (under 3 months for US citizens and 90 days for UK citizens) & the currency used is the Uruguayan Peso (as of 28th June 2016, £1 GBP was equal to UYP $40.99). Sand dunes in Uruguay. I'm a Sandboarding writer so I'll blog on what I know best, I've only managed to find 2 notable sandboarding hotspots (there are more but they primarily lie on the coastal areas) in the country: Lomas de Solymar in Canelones department & Barra de Valizas in Rocha department. The National Park of Cabo Polonio is also home to some high dunes, they may be protected but I couldn't find any restrictions, however I wouldn't risk it. They look good to go down but since they're primarily on coastal areas, it makes Uruguay a bit like the UK in my opinion, so if I ever visited this country to do some Sandboarding, it might make me feel at home as the temperature is pretty good as well as it's the only South American country that's not within the tropics. I'd like to make a final statement on this article, it took me a good 4 hours to write this and I could vaguely recall learning some basic information about Uruguay when I was about 6 years old in school, after writing this article and presenting the facts and information to you now, my perception on Uruguay has changed, I want to go there, and I've definitely learned something from this! If there are any Sandboarding Nation readers who have ever been to Uruguay or indeed any Uruguayans reading this blog or post for the first time, please get in touch with me via Facebook, Twitter, or by commenting on this article if I've missed any information out.